Your newborn baby is home from the hospital and finally sleeping – but should you be worried about grunting noises? Parents are always happy to see their new baby sleeping but any grunt, groan, strain or cough can quickly catch your attention and get your mind racing – thinking that something might be wrong with their breathing! Sometime infants let out an occasional moan or sigh other babies put the phrase “sleep like a baby” to the test with the racket they make! Noisy sleep is normal for infants and small children – but you should still keep an eye on things (especially choking) if it sounds like they are having problems breathing and call 911 or schedule an appointment with your doctor. Most grunting and gurgling has to do with digestion or bowel – especially if they are changing diets or about to “go”. Gas, stomach acid and a full belly can all contribute when a newborn is learning to digest and process food with their weak abdominal muscles. Sleeping on the back also seems to make babies more vocally active – but this might just be another old wives tale. Still need more information – our expert guide will help make everything OK! Is it normal for a newborn to grunt while Sleeping? Yes – newborns (and humans of all ages) can make all kinds of noises and movements at night without waking up. If you take some time and watch your baby sleep you might be surprised how they stay asleep with how much noise they make! Swaddling can help by keeping them calm and comfortable but there will always be some amount of noise from the crib other creative options millennials are using is soothing sounds from Youtube. Keep a close eye out for any signs of choking or breathing problems. If you notice something wrong call 911 right away! Grunting baby syndrome is not a formal medical condition but it is commonly used to describe infants that have problems with their bowel movements – not noisy sleep habits like you might expect! Many new parents mistakenly associate the name with grunting while sleeping if they have not experienced baby poo problem. An active baby is a healthy baby! As long as your new family member is not in pain, having problems breathing or showing other signs of illness (like running a fever) there is probably nothing to worry about. 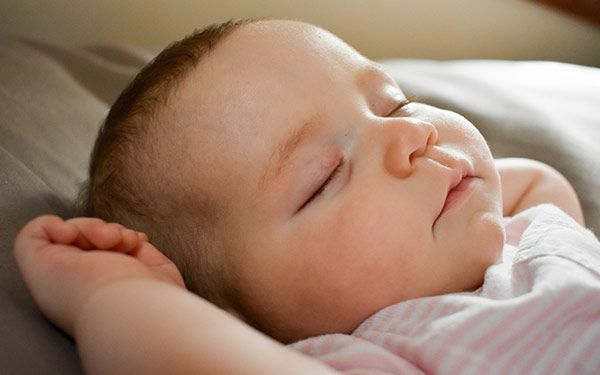 Babies breathing patterns slow to about half their normal respiration rate while sleeping. This lack of breathing – plus associated noises can cause alarm in many new parents but fortunately there is nothing to worry about! If you do notice a persistent breathing problem, cough, or wheezing noise you should mention it to your family doctor and see if you should schedule an appointment.